A dream car is one of those things that’s hard to justify spending your living on. My solution: earn little by little completing tasks on Swagbucks, and save it up over time (lots of time) to eventually pay for the car of my dreams. 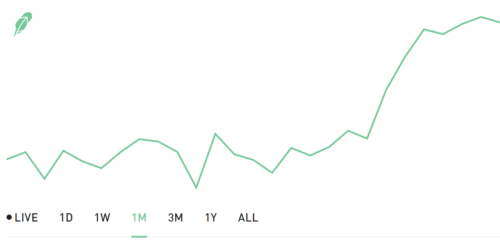 I’ll be posting progress updates on this blog, as well as more details about my Swagbucks earnings and Robinhood investments. Swagbucks is a place where you can earn real money for doing things like filling out surveys, completing offers, even for just watching videos or playing games! 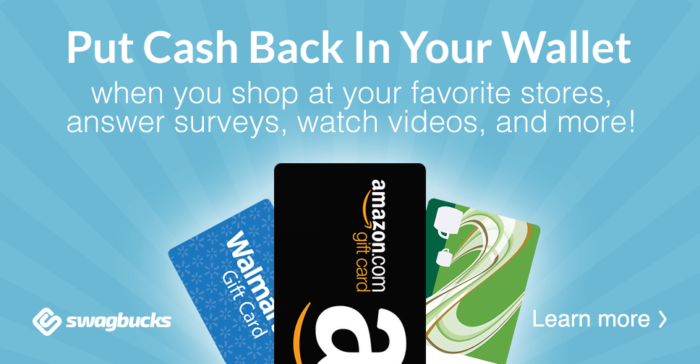 You can also earn pretty decent cashback rewards for your online shopping. Your earnings can be cashed out into a wide variety of gift cards (sometimes for an additional discount) like Amazon, Walmart, or a Visa Prepaid Card. Or you can have your SB sent straight to your PayPal account, as I do, so I can transfer it to my Robinhood investment account and save it up for something bigger than just a free toaster! To help me reach my goal faster, I am investing my earnings in stocks and cryptocurrencies with Robinhood. Robinhood is a modern trading platform that doesn’t charge any commissions for trades. This will make it much easier and more profitable for me to work with smaller amounts. I am very new to the stock market, but using the basic principles of buying low and selling high I’m hoping that I can earn a significant return on investment. So far, the results have been very promising! The two ultimate bullet points for my “dream car” are, #1: Fully Electric, and #2: Self-Driving. Everything else is nice, but negotiable. Right now, the car that fits the bill is the Tesla Model 3. I’ve been a big fan of Tesla since they released their first roadster. It’s a huge dream of mine to own an electric car, and I believe Tesla is the best at this. 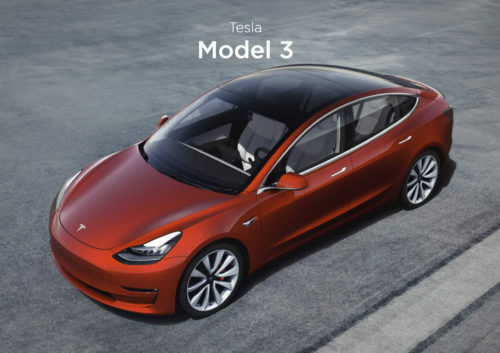 The Model 3 is their most affordable car yet, starting at (only) $35,000 for the base model. Adding fully self-driving capability will add another $8,000 to the price. The prices can and definitely will change by the time I’m ready to order, and it’s anyone’s guess what the tax incentives will be at that time. So for now I am loosely setting my goal at $40,000. I joined Swagbucks exactly 2 months ago. In that time I’ve earned 24,239 SB (the Swagbucks equivalent of $242). At that pace, it would take me almost 30 years to reach my goal! However, if my investments and trades do well, it should significantly bring that time down. And you can even help! If you join Swagbucks with my referral link, I will make a 10% commission on all of your earnings for life. (And you also get a nice bonus for signing up!) If I can get only 10 active people to join Swagbucks, that could potentially save me 15 years! If you’re interested in investing, you can also join Robinhood with my referral link and we both will get a free stock! So I encourage you to join Swagbucks and Robinhood and start your own goal! If your dream car sounds like too lofty of a goal, try something more manageable, like a new pair of shoes. Or take it to a whole different level and aim for a house! Let’s find out what’s possible with a little bit of work and a whole lot of patience! It all began one quiet, cold morning. I walked out to my car with my glass half full and my stomach half empty. Everything was looking like every other day, except for a little orange ticket that was wedged under my wiper blade and frozen onto my windshield. I studied it for a bit and noticed that “Alternate Parking” was checked. I wasn’t quite sure what this meant, but I went and paid the ticket like a good little boy. A while later, and a little farther into the winter season, I found another slip attached to my car. This wasn’t a ticket, but a notice explaining the alternate parking city ordinance. Basically, in the winter you park on the even numbered side of the street on the even days. So I began following this as well as I understood it. I soon discovered the wisdom in parking on the side where most of the cars were parked. Genius. Needless to say, I ended up with another ticket. That was it. I was now determined to never get another parking ticket. From then on, I always checked the date and the house numbers to make sure I was on the right side of the road. This worked until I moved into a new apartment with a parking lot. Pretty sweet, until all the parking spots are taken and you’re left out on the street again. This time I drove up and down the street squinting in the dark to find which was the odd side. I compulsively checked the date several times. No worries this time. To make a short story long, I got another ticket, was totally confused, drove up and down the street again just to check, was going to call the police to dispute, found on their website they changed the effective date without notice from before midnight to after 2am, emptied my glass to halfway, and paid the ticket like a good little boy. I’ve now accepted that parking tickets are just a source of income for the police. They pick out random cars to ticket and reap the profits. I am merely a preferred customer. I’m not very good at making trivial decisions. If it wasn’t for my fiance, I’d still be thinking about what I should have for dinner last Tuesday. So when you stink at making decisions and you’re going to order takeout food, how do you decide whether you should go through the drive thru or walk in and takeout? I pondered this for a while. I was by myself, so there was no one I could ask to make the decision for me. It was cold outside, and I would have to face the weather either by walking out in the cold, or by rolling down my window in the drive thru. I asked my car what I should do, and luckily he answered and my debate was solved. My window was frozen shut. I really hate to label females as poor drivers, but they leave me no choice. Typically the car that doesn’t have the big red STOP sign has the right of way, correct? At least that’s what I’ve been told. Maybe she had a different driver’s ed teacher, but this girl seemed to think that she could just pull out right in front of me in an icy intersection. I don’t think I’ve ever screeched my tires that hard before. Since she was stopped in front of me, I waited for her to go so I could get out of the dead center of the intersection. When I decided that I wasn’t going to wait any longer I started to pull around her, and as soon as I did she started heading for the side of my car. So I sped up and swerved out of the way. I once again thought I was safe until she zipped up right behind me and started tailgating me. It seemed like she was determined to get me one way or another. So I ran and hid as fast as I could. I guess the method I’ve always used to avoid girls should be practiced both on and off the road. I’m no fan of Halloween, so it’s merely a coincidence that I’m sharing a scary story at this time of the year. Brace yourself and prepare to be frightened. I had just exited walmart and walked up to my car. No sooner had I gotten inside and turned on the engine than I noticed the small red car in front of me creeping forward. It kept creeping and creeping slowly forward until it was so close to my car that there was no chance that I could get out of there without at least a poke at my bumper. This “creepy car” as we’ll call it, wasn’t exactly the shiniest car in the lot, to say the least. This made me fear that they maybe didn’t have the greatest insurance plan, which is kind of a scary thought. Inevitably the two cars made contact. An interesting note is that since both cars were red, any exchange of paint would be unnoticeable, which could be a good or bad thing. Luckily though, my license plate sticks out far enough that no layers of paint were laid. Well none that I noticed anyway. You might be thinking that’s not so scary. But that’s not the scary story. The scary part is that as I watched the creepy car creep towards me, my life flashed before my eyes. And that’s a scary story. (If your idea of scary is unbearably boring.) To give you an idea, most people would shriek and run away if my life was flashed before their eyes. Which leads me to my newest invention, the Flashlife ™. It’s a simple device like a flashlight that projects a series of images at undesirable life forms, flashing my life before their eyes. It’s more effective than pepper spray, and more convenient than explosives (and less illegal). I might use it tomorrow night to keep away any zombies or Frankensteins that wander up to my door. And to get back at that creepy car. Sitting at a stoplight the other day, I was startled by this loud, clangy bang sound followed by a continuous scraping noise. I looked in the direction and saw a rusted through car fleeing the scene. 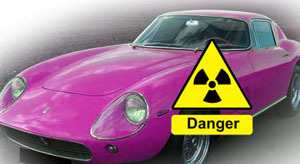 It looked like a pretty ordinary car, except that it had one distinguishing feature. The exhaust system was dragging on the ground. Well at least the parts that were still attached anyway. It’s things like this that make me feel good about my car. …blup-blup-blup …that’s the lovely sound my car made last night when my tire decided to go flat. I was so excited that I was going to get to change a flat tire…until I opened up the spare tire compartment in my car and found that there was no car jack. One other small detail was that the spare tire itself was also flat with a big gouge in it. Well after getting a ride from a friend, I found out how helpful Wal-Mart is, seeing as they don’t carry any sort of spare tire replacement. Today’s lesson: replace your tires before they get completely bald. Driving my car in to work this morning, I noticed that something was different. Something just wasn’t right. It didn’t seem like the same old, rusty car that I’ve grown used to. For some reason, it actually goes when I push the gas pedal, and it actually stops when I push the brake. All those rattling, squeaking, and grinding noises that I’m used to hearing are all gone. And strangely, when I got out of my car and pushed the door shut, there wasn’t a massive pile of rust settling to the ground. And for some reason, where it used to say 1991 Chevy Cavalier, it now reads 2003 Dodge Neon. All of these things lead me to an intense longing for my old car. But don’t worry, I think I’ll be able to manage.